Rice Krispies are a childhood staple, but are definitely NOT vegan. Which is why we were determined to make Vegan Rice Krispie Squares. Turns out, they’re super simple to make as long as you know where to find the right ingredients! 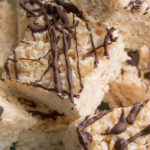 For a little added fun, we decided to spice things up by adding a chocolate drizzle to our Vegan Rice Krispies Squares. We use vegan chocolate chips so it melts better than a dark chocolate bar. When we first made these vegan Rice Krispie Squares vegan marshmallows were a bit tricky to find. In Canada, we tend to only have Dandie’s as our vegan brand, and they used to be so hard to find. Nowadays, it seems like they’re everywhere! Bulk Barn, health stores, it’s really making these squares much easier to make. Want more square desserts to put on a platter? Try our Brownies or Dream Bars! Want a flatter dessert that’s just as yummy? Our Spiced Oatmeal Cookies are great too! Put marshmallows and butter in a microwave safe bowl. Cook in microwave for 1 1/2 minutes, stir, and put in for another 1 1/2 minutes. Add Rice Krispies cereal to marshmallow mixture and mix until well incorporated. In a baking or casserole dish, press mixture in flat so the top is smoothe. If you decide to add chocolate drizzle, melt chocolate chips down and drizzle on top of squares at this point. 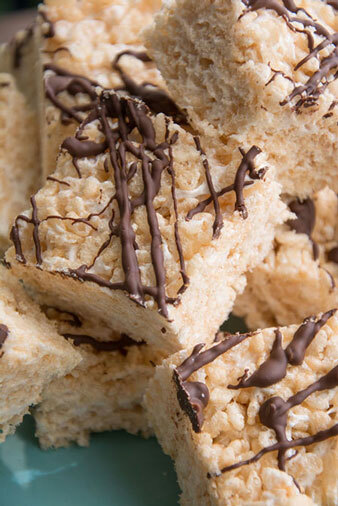 Put Rice Krispies in the fridge until firm, we recommend at least an hour.